Directions: This bridge is located in Conway, at the East of the Green Mountain National Forest, just after the Saco River and the Swift River merge. 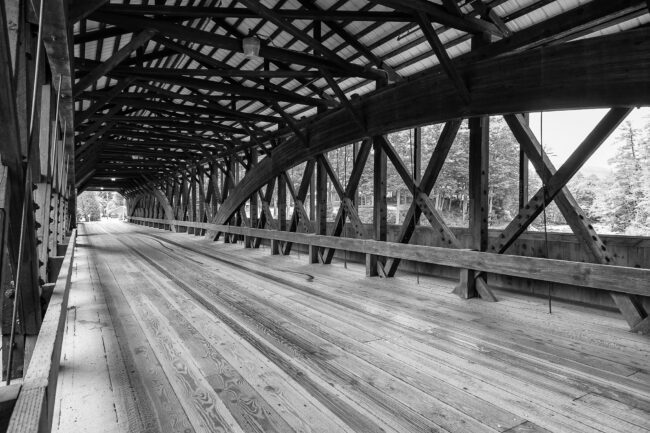 There are several covered bridges in Vermont and New Hampshire. This one can be crossed, whereas some others are closed (sometimes only to car, sometimes to both car and pedestrians). Any touristic map of the region will list the other bridges. Of course, you should pay attention to crossing cars or motorbikes when taking pictures, so try to avoid tripods. Since Conway is at the entrance of the White Mountains, enjoy some hikes in the area.